Aluminum blinds are available with three different slat sizes: the standard 1-inch mini, 1 3/8” mini, micro (1/2-inch), and macro (2-inch) aluminum slats to create the look that’s right for you. 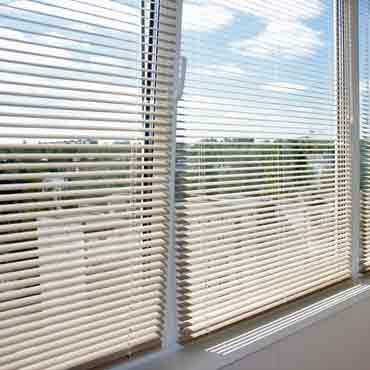 These blinds are available in over 100 colors and finishes. Decorative cloth tapes are available with the 2-inch product. Slats are available in 6, 8, or 9-gauge aluminum. The higher gauge the aluminum the more durable the slat resulting in a lower chance of permanent bending or denting. These blinds are easy to maintain.